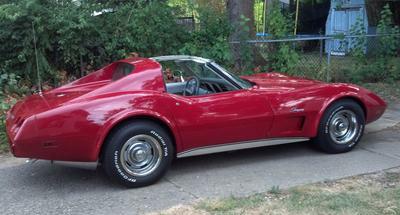 9/20/2013 (Springfield, Illinois) - 1976 Corvette Stingray, L48, PS, PB, PW, A/T, 82k original miles. Never wrecked. New tires, suspension, exhaust, front/rear bearings and seals, dash, water pump, timing chain and radiator - runs like a top. Updated air conditioning system. Fresh paint on front because of bubbling - Corvette Red. T-tops and factory alarm. Complete list of all updates available upon request. Ready to drive for Route 66 Fest! Contact Mark on 217-494-1122 or email at drmarke@aol.com.